Question: I read an article about anti-hair loss ingredients that are used in shampoos like saw palmetto and pumpkin seed oil. Do these work? I have thinning hair mostly around my crown and want to use the best shampoo to grow my hair back. Answer: Hi, Troy. There are a lot of products marketed as helping hair loss that aren’t actually as effective as the claims may suggest. This was confirmed through research by UK consumer rights organisation Which? who investigated the efficacy of shampoo for thinning hair from a range of brands and evaluated it against the marketing claims each made, regarding promising thicker hair, or even preventing baldness. There are a number of natural hair loss remedies that are believed to help inhibit the DHT which causes hair thinning in cases of male pattern baldness due to an inherited sensitivity towards this hormone. These include saw palmetto, soy isoflavones, pumpkin seed oil and green tea. The extent to which these herbs and ingredients can help genetic hairloss is yet to be conclusively proven through reliable, widespread clinical studies. Tests that have been done have generally been carried out using orally administered formulas. We do, in fact, include saw palmetto in Belgravia’s highly-targeted food supplement, Hair Vitalics for Men which can be used in addition to clinically-proven hair loss treatments. 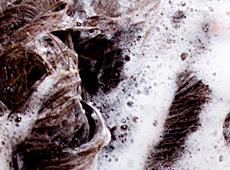 When they are used in a shampoo formulation, it is unlikely that they will have any meaningful benefits. The reason for this is that, when you wash your hair, shampoo is simply applied to the scalp, massaged in and rinsed away, meaning there is no time for the diluted ingredients to be absorbed by the scalp. The ingredients in shampoos are not meant to absorb into the scalp – if they did, your scalp would be absorbing a lot of detergent as well as anything of any potential benefit! Shampoo is widely regarded as an inefficient method of delivering hair loss medication, which is why the only clinically-proven topical hair loss treatment, minoxidil, is not available in this format. If you are concerned about a thinning crown, there are effective treatments available and suitable hair regimens can be personalised to your your precise needs and can be used alongside the shampoo of your choosing. 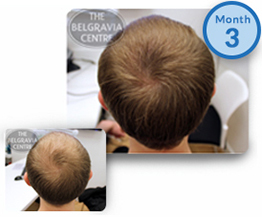 Men in this predicament often follow a course containing one or both of the only MHRA licensed and FDA approved male pattern baldness treatments: recommended formulations of high strength minoxidil to promote regrowth, and the daily DHT-blocker, finasteride 1mg, which comes as an oral tablet. When the proper treatment is recommended and followed consistently as directed, this approach can often produce significant results. The world's largest collection of hair loss success stories, with photos and comments from patients who are using our treatment programmes.